Choosing the right findings and finishing techniques can transform an ordinary piece of jewelry from simple to stunning. This guide describes how to use purchased findings, provides techniques for creating unique ones, and shares innovative ways to finish necklaces, bracelets, earrings, and pins. Each finding and finishing technique-whether it's a description of a barrel clasp, instructions on making your own beaded clasp, or methods for attaching a pin back-is presented in detail with colorful illustrations and photographs. Projects are integrated throughout the book to illustrate the techniques presented. 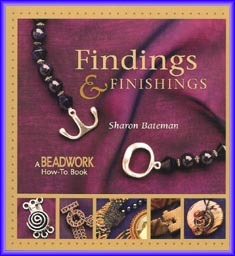 Sharon Bateman teaches beading workshops and has written articles and created projects for Beadwork, Bead and Button, Lapidary Journal, and Jewelry Crafts. She lives in Rathdrum, Idaho.